That’s right folks, Firestorm the Nuclear Man #1 on sale December 6 … in the year 1977. Isn’t this a great house ad? I love it! I especially dig the Professor and Ronnie’s silhouettes in the background. 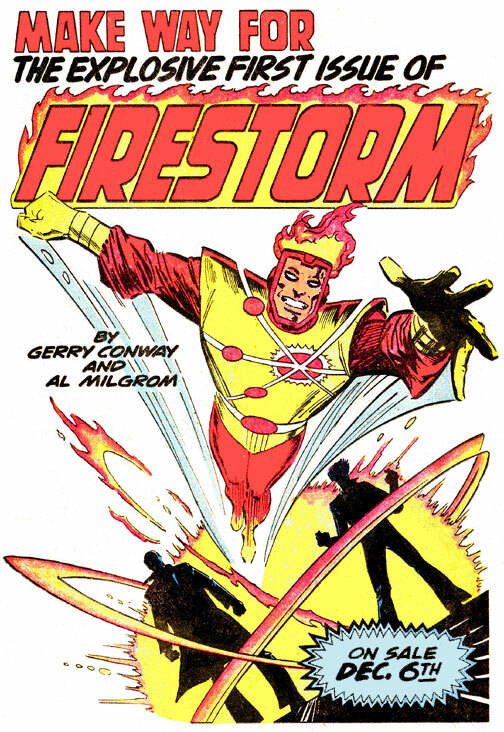 This also proves that Firestorm’s first appearance was in 1977 — December 6 to be exact. His first issue is cover-dated March 1978, but it was actually released in December 1977. That means Firestorm was born the same year as the original Star Wars! Bringing it back to present day, we gotta keep our fingers crossed for a new ongoing series. No announcements regarding Firestorm came out of the New York Comic Con. Geoff Johns mentioned lots of plans for Aquaman post-Brightest Day and James Robinson slipped he’ll be working on a Hawkman project coming up. Sadly there was very little Firestorm chatter coming out of this event. I actually got excited at the prospect. I just saw this ad in an issue of Showcase I scored from my LCS.